EssentOne Inventory includes major tools to control all of your product and service offerings. With EssentOne Inventory, you’ll effortlessly control all of your offerings and know the status of each at all times. 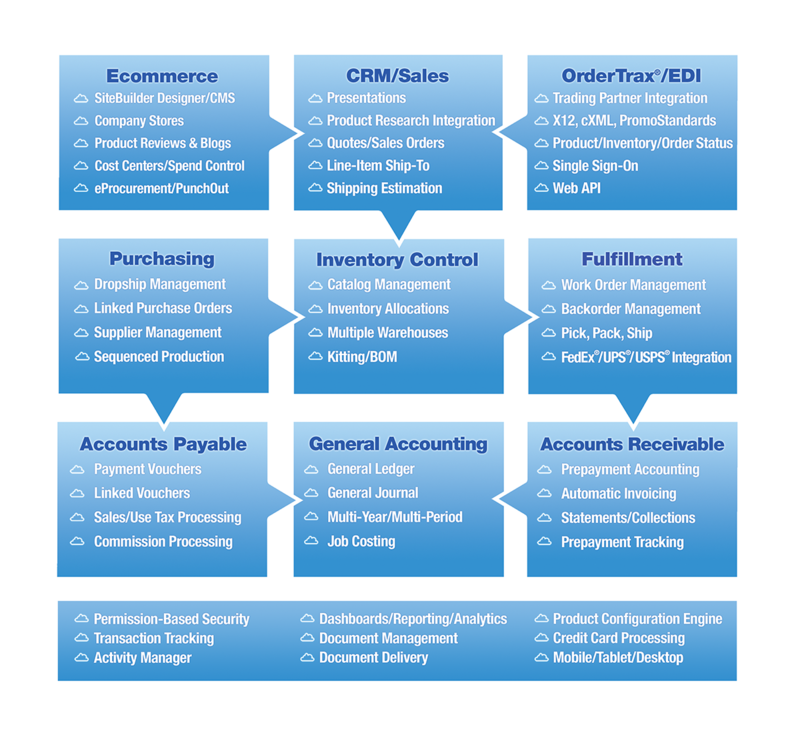 Organize offerings into logical groupings that are relevant to your business: branch, location, categories, subcategories. Both products and services offer multiple pricing models – giving you unlimited flexibility in creating special pricing for customers without having to define pricing for each and every customer. With Alternate Pricing management, create optional contract or promotional pricing for a customer or group of customers for a date range. All product offerings are defined by an ID, Stock Keeping Unit (SKU), Universal Product Code (UPC), name, description, multi-level pricing, and multiple inventory locations. Optionally track products by Lot Number or Serial Number. All relevant inventory stock metrics are tracked: On-Hand, On-Order, Backordered, and Available. With EssentOne Inventory know stock metrics down to the Lot Number or individual Serial Number. Shipping information, including package dimensions, weight, shipping charges, and handling fees, can be optionally entered. Control planning as-well-as stock levels. Through Material Requirements Planning, define replenishing rules and lead-times that are used to automatically calculate product quantities that are required to satisfy customer orders, backorders, and stock levels. Purchase Order and Supplier management is just as powerful. Assign multiple suppliers to each product, including part numbers and purchasing history. Manually create Purchase Orders or automatically generate them from required inventory quantities identified through Material Requirements Planning. Optionally track Products by Serial Number. Optional Generation of Product SKUs and Service Codes. Organize Products and Services by user-defined Category and Subcategory. Assign multiple Suppliers to each Product. Track Manufacturer and Manufacturer Part Number. Assign multiple warehouses for each Product. Define replenishing rules, including Minimum Reorder Point and Reorder Quantity, for each warehouse. Track non-traditional inventory locations including Service Centers, Service Vehicles, and Tool Kits. Automatic calculation of Required Inventory. Create millions of Purchase Orders. Automatic Purchase Order Number generation. Receive Inventory against Purchase Orders. Track Average Cost, Standard Cost, and Actual Cost. Easy Inventory Adjustments and manual Receipts. EssentOne Inventory is modern. EssentOne Inventory automates the tedious tasks, providing you with the time to focus on important inventory control activities. Know the value of your inventory at any time through real-time cost tracking. Standard Costs, Average Inventory Costs, and Actual Costs are linked to each and every product. EssentOne Inventory can easily track thousands of products and services with thousands of transactions day-in and day-out. The system automatically records all critical information and quickly recalls it at any time: offering information, inventory transactions, costs, suppliers, purchases, sales, and history are logically organized instantly available. Create user-defined data elements, called Properties, to further organize product and service attributes. Fully integrated with EssentOne Accounting, EssentOne Customer Service, EssentOne Fulfillment, EssentOne Web StoreFront, and the EssentOne Operations Management System, EssentOne Inventory unites the information generated by sales, fulfillment, and accounting activities. All product and service information is logically organized and available at your fingertips, providing the information needed to control inventory. Wide support for industry standards like barcodes and Universal Product Codes (UPC) makes doing business more efficient. Inventory control technologies like barcodes and integrated auditing tools like data collectors, so inventory control problems can be identified and resolved accurately and inexpensively. Part of the EssentOne Operations Management System. Save time and reduce errors by eliminating redundant data entry. Sophisticated Material Requirement Planning optimizes stock levels to reduce holding costs and increase availability for fulfillment. Pay less yet have more satisfied customers. Feature-rich inventory control tools preserves a valuable asset. Reliable auditing tools protect your investment.